This era was defined by simple, hand created products. A household would produce and consume what they needed, so little marketing was needed. 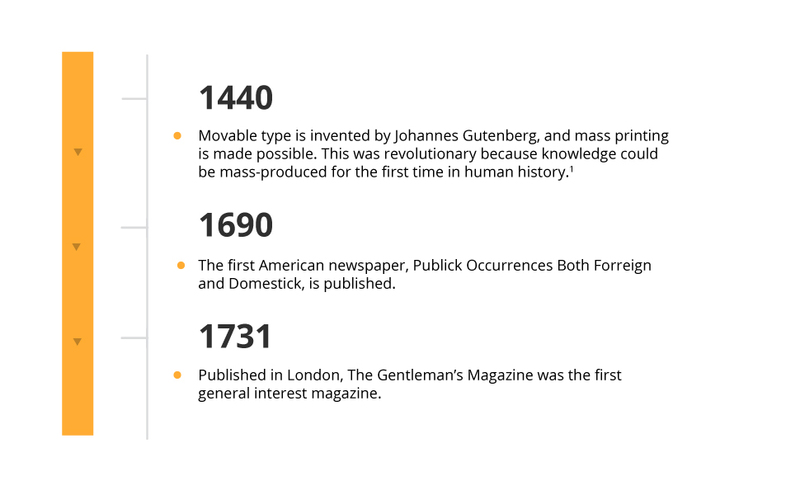 However, what would become major marketing platforms, such as newspaper and magazines, were invented during these early stages. As the market became saturated with mass-produced products, competition began to increase. The marketing tactic during this era relied heavily on sales techniques and undercutting the price of competitors with little concern for quality and customer satisfaction. 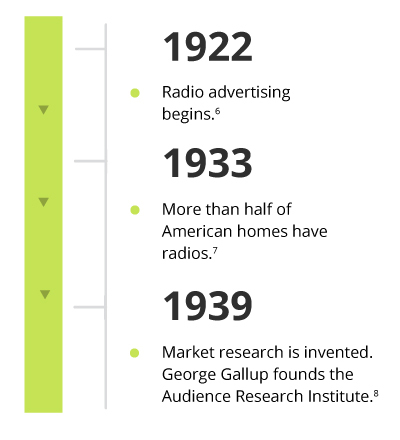 Together with print media, radio became a popular advertising channel. In this era, inbound or permission marketing takes off. The relationship between customers and businesses shifts as customers begin to dictate how they receive content as opposed to businesses pushing content. By signing up to a newsletter or following a brand on social media, you invite the content you want into your life. 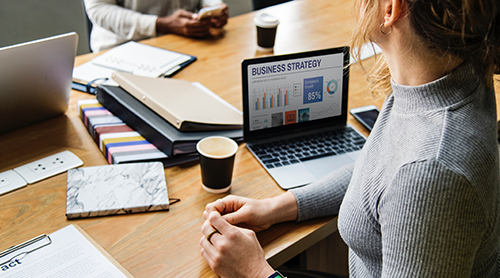 As technology continues to rapidly disrupt industries, it is essential to adapt with it and understand how trends in marketing could affect you or your business. The only way to foresee how great the change will be is to remain as relevant as possible as new trends and technology become available every day. 1 Palermo, E. (Feb, 2014). ‘Who invented the printing press?’. Retrieved from LiveScience. 2 Lambert, T. (2018). 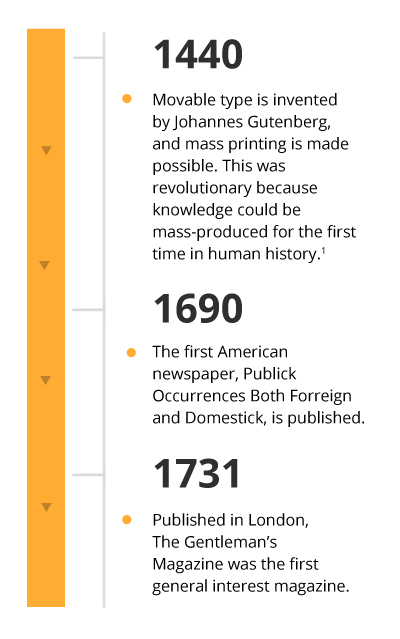 ‘A brief history of newspapers’. Retrieved from: Localhistories. 3 Faudree, M. (Oct, 2016). ‘The seven eras of marketing’. Retrieved from Simplexity. 4 Wainwright, C. (Feb, 2012). ‘The history of marketing: An exhaustive timeline [infographic]’. Retrieved from HubSpot. 5 Faudree, M. (Oct, 2016). ‘The seven eras of marketing’. Retrieved from Simplexity. 6 Wainwright, C. (Feb, 2012). ‘The history of marketing: An exhaustive timeline [infographic]’. Retrieved from HubSpot. 7 Wainwright, C. (Feb, 2012). ‘The history of marketing: An exhaustive timeline [infographic]’. Retrieved from HubSpot. 8 Johnson, B. (Mar, 2010). ‘From the great depression through the great recession: A brief history of marketing’. Retrieved from AdAge. 11 The Drum. (Mar, 2016). ‘1941: Bulova airs first-ever TV commercial in 1941 before Brooklyn Dodgers game’. Retrieved from The Drum. 12 Wainwright, C. (Feb, 2012). ‘The history of marketing: An exhaustive timeline [infographic]’. Retrieved from HubSpot. 13 Faudree, M. (Oct, 2016). ‘The seven eras of marketing’. Retrieved from Simplexity. 14 Wainwright, C. (Feb, 2012). 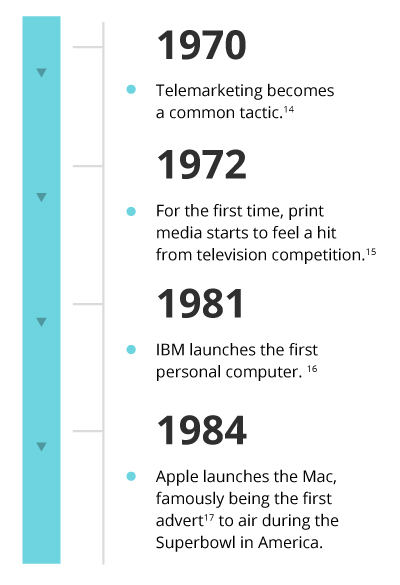 ‘The history of marketing: An exhaustive timeline [infographic]’. Retrieved from HubSpot. 15 Wainwright, C. (Feb, 2012). ‘The history of marketing: An exhaustive timeline [infographic]’. Retrieved from HubSpot. 16 Wainwright, C. (Feb, 2012). ‘The history of marketing: An exhaustive timeline [infographic]’. Retrieved from HubSpot. 17 Taube, A. (Jan, 2014). ‘How the greatest super bowl ad ever – Apple’s ‘1984’ – almost didn’t make it to air’. Retrieved from Business Insider. 18 Faudree, M. (Oct, 2016). ‘The seven eras of marketing’. Retrieved from Simplexity. 19 Nayar, V. (Aug, 2017). ‘The history and evolution of digital marketing’. Retrieved from AvivDigital. 20 Singel, R. (Oct, 2010). ‘Oct. 27, 1994: Web Gives Birth to Banner Ads’. Retrieved from Wired. 21 Oberoi, A. (Jul, 2013). 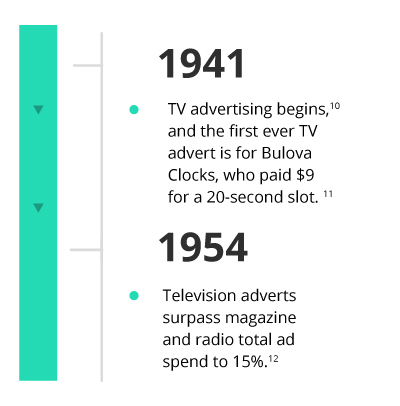 ‘The history of online advertising’. Retrieved from Adpushup. 27 Nayar, V. (Aug, 2017). ‘The history and evolution of digital marketing’. Retrieved from AvivDigital. 28 Oberoi, A. (Jul, 2013). 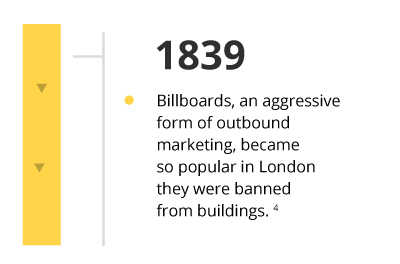 ‘The history of online advertising’. Retrieved from Adpushup. 30 Teese, C. (Mar, 2017). ‘How does google rank websites?’ Retrieved from Victorious. 31 (Nd). ‘Radio, television and publishers’ advertising representatives’. Retrieved from Reference for Business. 33 Smith, K. (Nd). ‘History of the dot-com bubble burst and how to avoid another’. Retrieved from Money Crashers. 35 Joanna, M. (Feb, 2018). 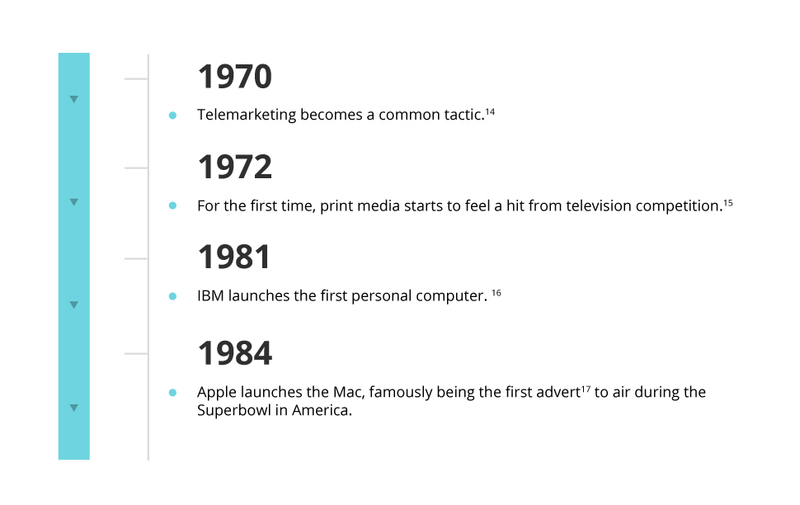 ‘A brief history of digital marketing’. Retrieved from The Digital Scot. 36 Rouse, M. (Jul, 2016). ‘Definition: Linkedin’. Retrieved from What Is It. 37 Nayar, V. (Aug, 2017). ‘The history and evolution of digital marketing’. Retrieved from AvivDigital. 38 Wainwright, C. (Feb, 2012). ‘The history of marketing: An exhaustive timeline [infographic]’. Retrieved from HubSpot. 39 Nayar, V. (Aug, 2017). ‘The history and evolution of digital marketing’. Retrieved from AvivDigital. 40 Nayar, V. (Aug, 2017). ‘The history and evolution of digital marketing’. Retrieved from AvivDigital. 41 Nayar, V. (Aug, 2017). ‘The history and evolution of digital marketing’. Retrieved from AvivDigital. 42 Nayar, V. (Aug, 2017). ‘The history and evolution of digital marketing’. Retrieved from AvivDigital. 43 Joanna, M. (Feb, 2018). 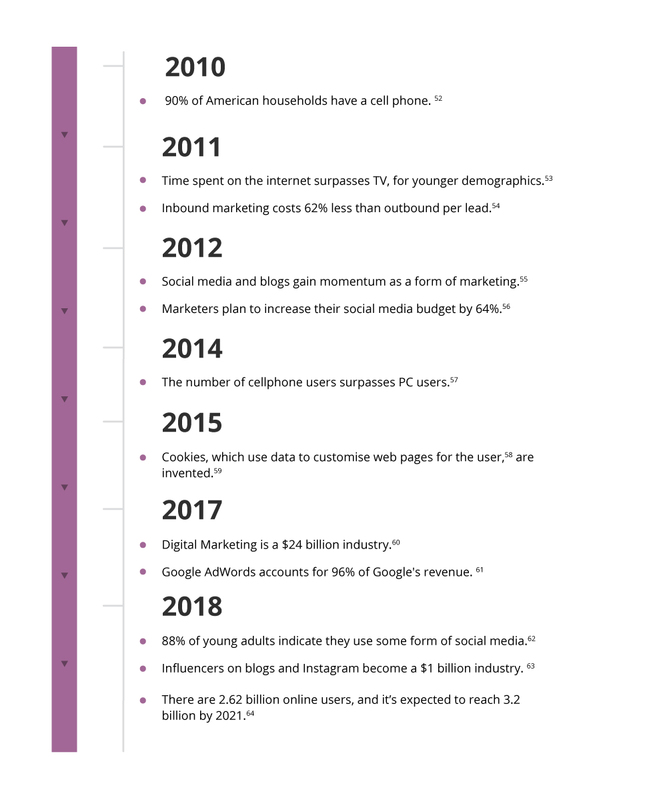 ‘A brief history of digital marketing’. Retrieved from The Digital Scot. 44 Joanna, M. (Feb, 2018). ‘A brief history of digital marketing’. Retrieved from The Digital Scot. 45 Nayar, V. (Aug, 2017). ‘The history and evolution of digital marketing’. Retrieved from AvivDigital. 46 Wainwright, C. (Feb, 2012). ‘The history of marketing: An exhaustive timeline [infographic]’. Retrieved from HubSpot. 47 Joanna, M. (Feb, 2018). ‘A brief history of digital marketing’. Retrieved from The Digital Scot. 49 Nayar, V. (Aug, 2017). ‘The history and evolution of digital marketing’. Retrieved from AvivDigital. 50 Nayar, V. (Aug, 2017). ‘The history and evolution of digital marketing’. Retrieved from AvivDigital. 51 Faudree, M. (Oct, 2016). ‘The seven eras of marketing’. Retrieved from Simplexity. 55 Nayar, V. (Aug, 2017). ‘The history and evolution of digital marketing’. Retrieved from AvivDigital. 56 Nayar, V. (Aug, 2017). ‘The history and evolution of digital marketing’. Retrieved from AvivDigital. 57 Nayar, V. (Aug, 2017). ‘The history and evolution of digital marketing’. Retrieved from AvivDigital. 58 Collins, J. (Aug, 2018). ‘What are cookies on a computer?’ Retrieved from Lifewire. 59 Nayar, V. (Aug, 2017). ‘The history and evolution of digital marketing’. Retrieved from AvivDigital. 60 Joanna, M. (Feb, 2018). ‘A brief history of digital marketing’. Retrieved from The Digital Scot. 61 Joanna, M. (Feb, 2018). ‘A brief history of digital marketing’. Retrieved from The Digital Scot. 62 Smith, A., Anderson, M. (Mar, 2018). ‘Social media use in 2018’. Retrieved from Pew Research Center. 63 Joanna, M. (Feb, 2018). ‘A brief history of digital marketing’. Retrieved from The Digital Scot. 64 Statista. (2018). ‘Number of social network users worldwide from 2010 to 2021 (in billions)’. Retrieved from Statista. 68 Demand Base. (Dec, 2016). ‘80 percent of all marketing executives predict artificial intelligence will revolutionize marketing by 2020’. Retrieved from Demand Base.